Shooters who use fast-handling AR platform rifles understand the need for a light, do-it-all riflescope that can keep up. That's why Nikon has come out with the new P-223 1.5-4.5x20 BDC 600 riflescope. Not only does it feature an AR-specific design, but at 13.8 ounces, it's an incredibly lightweight option. Developed specifically for the trajectory of the .223 Rem /5.56 NATO round with 55-grain polymer tip bullet, the new BDC 600 reticle offers shooters unique open circle aiming points and hash marks at 200, 300, 400, 500 and 600 yards with additional hash-marks at 250, 350, 450 and 550 yards. Multiple layers of anti-reflective compounds on every glass surface provide bright, vivid pictures and optimum light transmission from dawn to dusk. 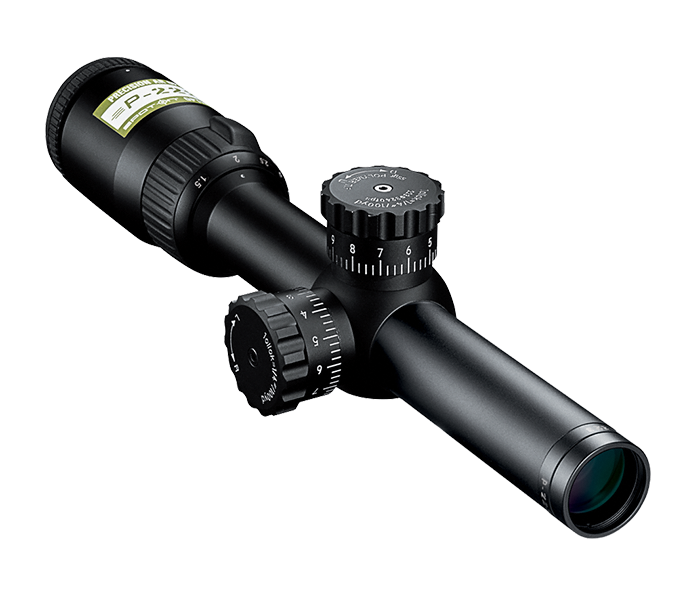 To simplify field adjustments, Nikon has integrated this feature into the P-223 riflescope. Just sight-in as usual, then lift the spring-loaded adjustment knob, rotate to your “zero”, and re-engage. Field adjustments are now as simple as dialing-in your subsequent ranges. The P-223, like all of Nikon’s riflescopes, is optimized for use with Nikon Spot On™ Ballistic Match Technology. Spot On allows you to discover all of the exact aiming points on your scope’s reticle at various yardages for your specific ammunition and load. Keeps your brow safe, even with the heaviest recoiling cartridges, lighweight rifles and severe shooting angles.